The Hangar is an exhibition, catwalk and event space at the Brunswick campus of RMIT University designed by Paul Morgan Architects in collaboration with ZILKA Studio. The textile technique of pleating acoustic material provides a catwalk backdrop of movement and intricacy. 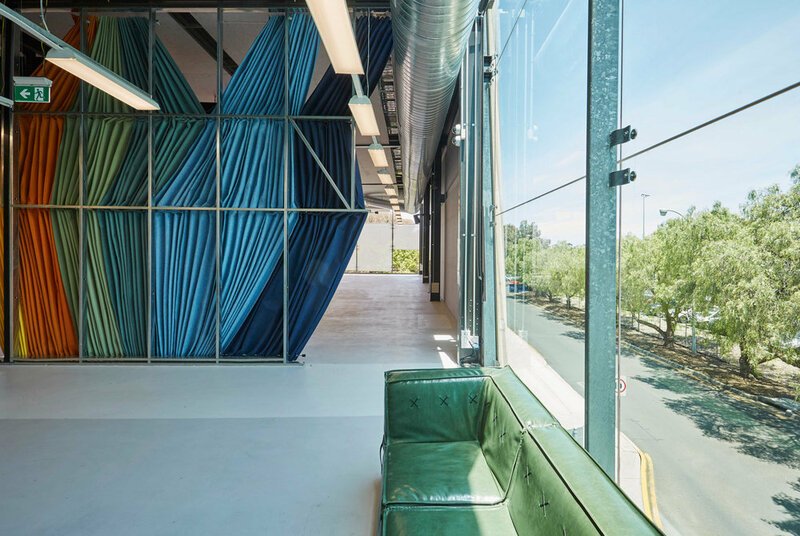 Commissioned by RMIT University, Paul Morgan Architects collaborated with ZILKA Studio to produce The Hangar — an exhibition, catwalk and event space at the Brunswick campus. 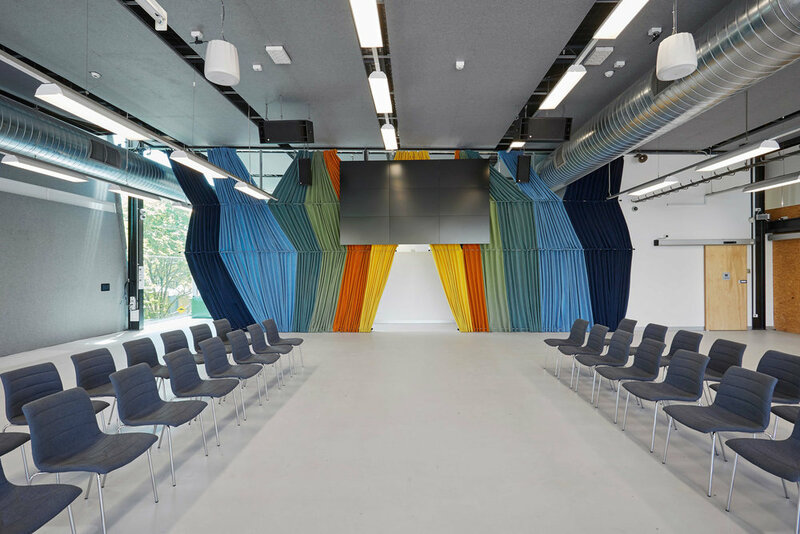 In solving the brief for an acoustic/ space divider for the School of Fashion & Textiles, the Frozen Curtain utilises the Pleat, created by carpenters, to provide a catwalk backdrop. Paul Morgan and Leanne Zilka worked together on the concept of a Frozen Curtain that could separate the back of house from the main space and provide a backdrop for the display of garments produced by RMIT fashion and textile design students. The activities within the fashion and textile design school at RMIT are often viewed by the public, international guests, industry partnerships and practitioners. The Frozen Curtain effectively creates a space that acts as a stage set for these activities. Referring to fashion and textile terminology such as the Pleat, a technique used to gather a wide length of fabric around a circumference, we explored how using an acoustic material with the fashion and textile technique of pleating, could be manipulated to respond to the space, structure and ductwork, expressing movement and intricacy. 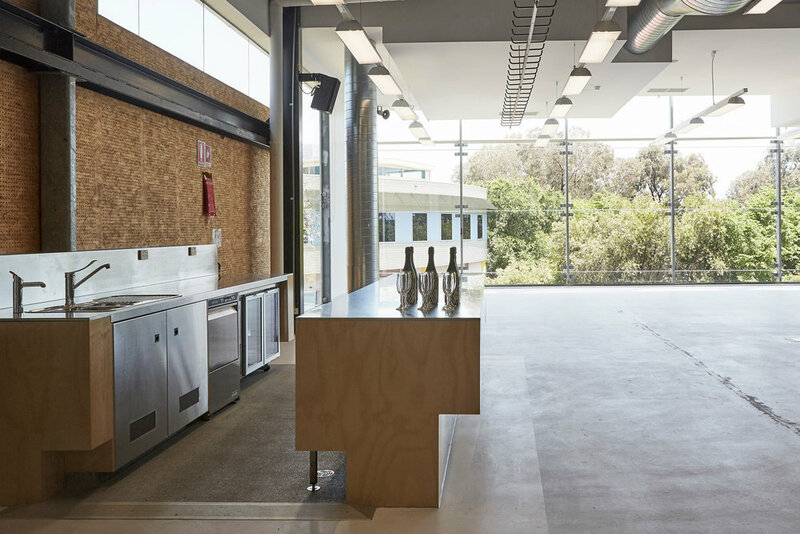 Change rooms, a green room, bar/servery and toilets completed the brief for the project.